The dominance of Korean beer in the domestic market is being challenged as drinkers turn to a wide range of affordable imported beer and wine and a culture of drinking alone at home spreads. Superstore chain E-Mart said Wednesday that Korean beer accounted for just 21.4 percent of its alcohol sales in 2018, down four percent from 2017. The proportion of imported beer rose to 25.3 percent, and that of wine to 22.7 percent. A shopper browses shelves of beer in a supermarket in Seoul on Sunday. Korean beer relinquished its top position to imported beer for the first time in 2017 and has now been further pushed down by wine. 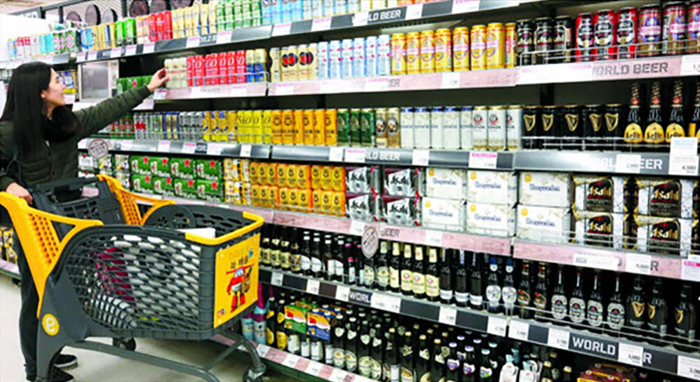 E-Mart sells over 500 different kinds of imported beer in its stores, compared to just 30 domestic ones. A staff at E-Mart said, "One of the major reasons for the downfall of domestic beer is that with more and more people trying to strike a balance between work and private life, so there is less of a culture of after-work drinking with colleagues."